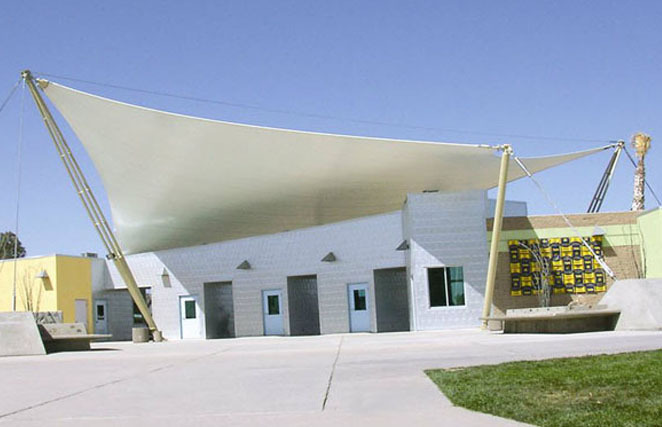 FabriTec Structures, LLC is a leading a design/build contractor specializing in tensile membrane architecture. 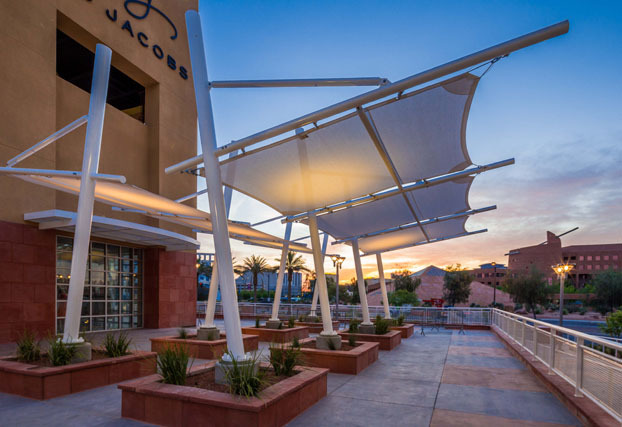 The company offers custom architectural fabric structures for a wide variety of markets including: Airports & Transportation, Retail, Hospitality, Stadiums & Athletic Arenas, Amphitheaters and much more. Expanding the boundaries of function and form, FabriTec’s designs enhance the landscape through inspiration and technical superiority. Visit http://www.fabritecstructures.com for more information or follow us on facebook/fabritec. 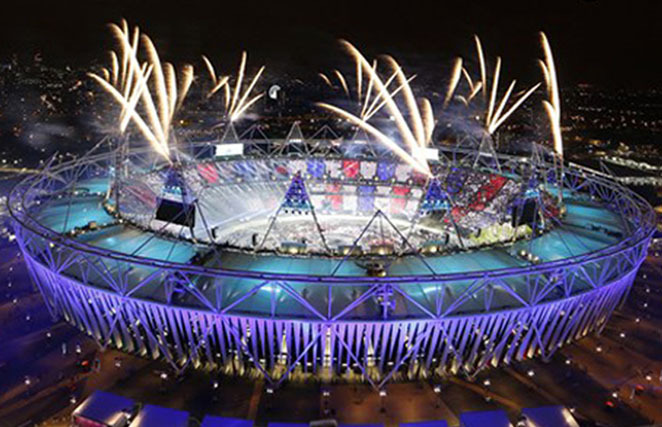 Olympic Stadium – London, England. 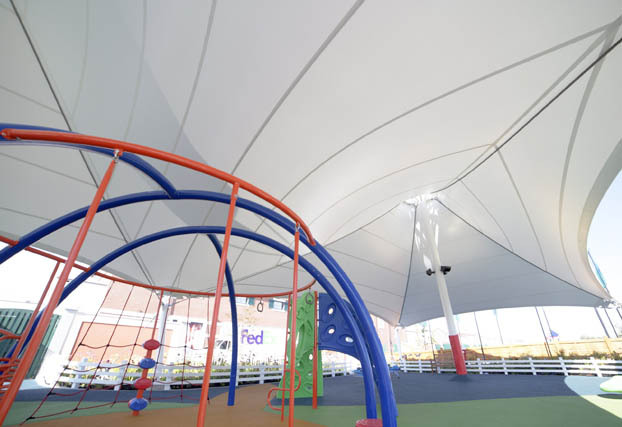 An innovative 200,010 ft. PTFE architectural fabric wrap. ShopWithMe – Chicago, IL. White ePTFE membrane roofing with clear PVC membrane sides totalling 7,560 sq. ft.
ShopWithMe – Chicago, IL. 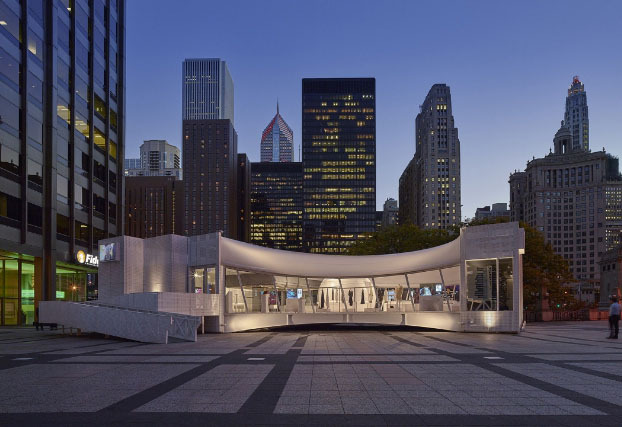 Pop-up retail store utilizes Lexan panels and custom aluminum break metal with structural steel mullions for a “clear view” in and out of the space. San Diego International Airport – San Diego, CA. 18 Pavilion canopies, 28 EDR canopies, 35 ground structure canopies, and 2 long-term parking canopies. 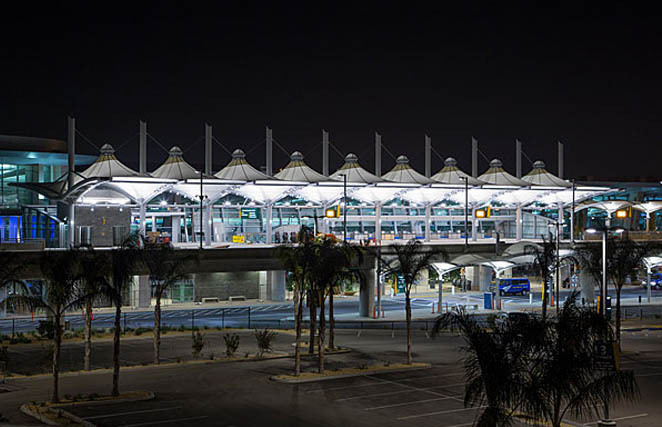 San Diego International Airport – San Diego, CA. “Smart Curb.” More than 70,000 square feet of surface area covered in PTFE architectural fabric. MGM CItyCenter People Mover – Las Vegas, NV. 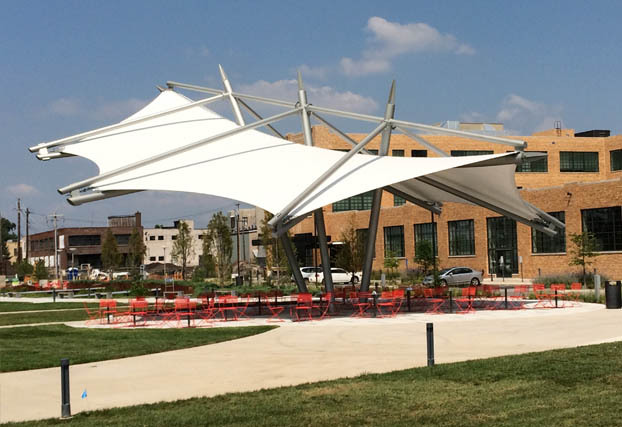 The “floating cloud” PTFE fabric canopy has approximately 19,140 square feet in surface area and was designed with catenary edges and large compression ring openings penetrating the tilted truss masts. Reid Park Zoo - .Tucson, AZ. With its dramatic slopes and curvatures, the structure captures about 70% of rainwater, which is drained into a cistern. Las Vegas North Premium Outlets – Las Vegas, NV. 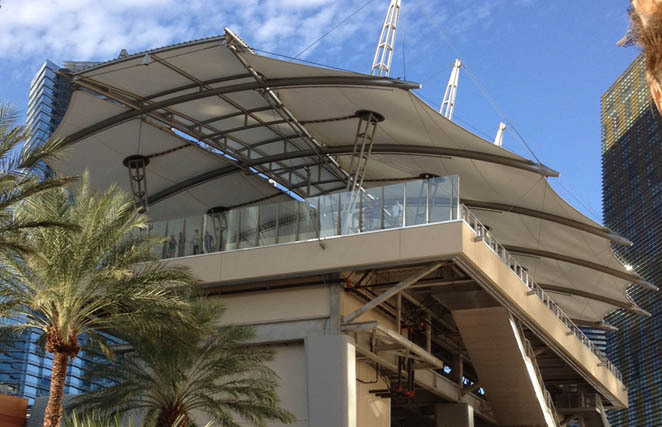 Features two (2) double mast tensile membranes PVC canopies and ten (10) HDPE structures supported by steel and cables. Transbay Temporary Terminal - San Francisco, CA. 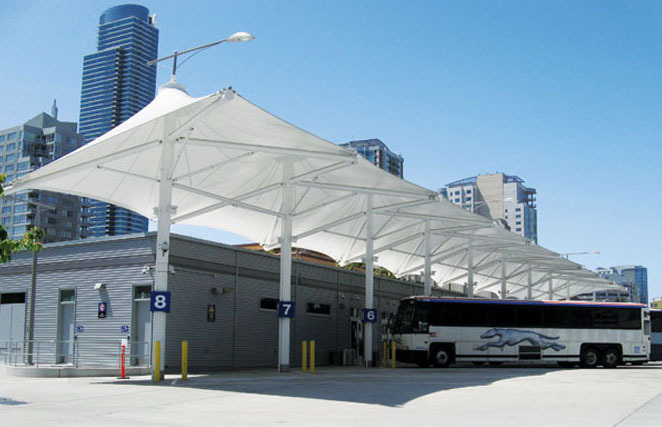 A frame-supported PVC shade structure at the San Francisco financial district area bus terminal. Cortex Pavilion – St. Louis, MO. AKA “The Bat Wing”. Material: PTFE Sheerfill II HT architectural membrane. McArthurGlen Designer Outlet – Vancouver, CAN. Material: Ferrari 1202T2 PVC architectural membrane with a PVDF Top Coat. McArthurGlen Designer Outlet – Vancouver, CAN. A 4,230 sq. ft mast-supported tension structure. 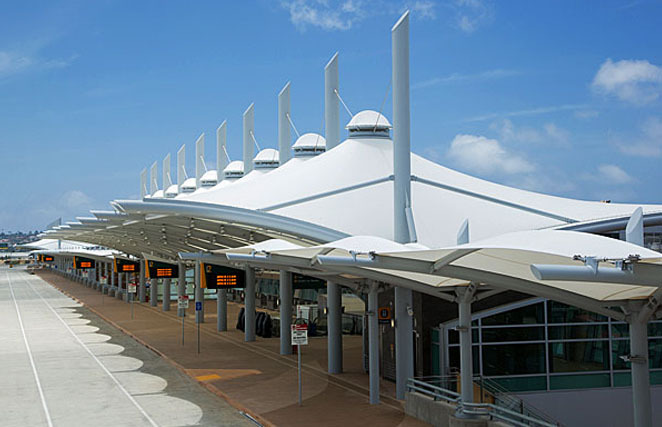 Our Portfolio: airports & transportation, athletic facilities, civic & community, education & institutional, entertainment & leisure, parks & recreation, retail & commercial, awnings. Our Process: Steel Fabrication, Fabric Fabrication, Construction. 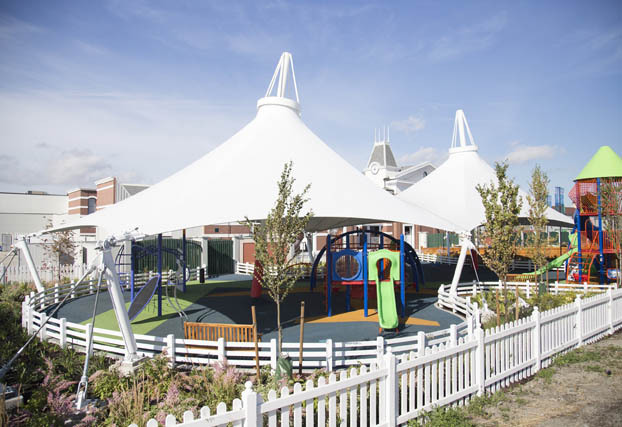 Our philosophical approach to sustainable design and the use of fabric structures is most successful when ALL three components—design, materials, and construction—are considered.